my bare cupboard: Cherry-lemon mini cheesecakes "
Valentine's Day is just around the corner and I had this idea of making minis with lovely hearts on top . In reality , the heart-shaped design that I envisioned looks like Pac-Man chasing each other and some even resembles sperm cells *see the 3rd photo below* lol Need to process the topping until smooth next time . I need to used up the remaining cherry and strawberry sauce that I made more than 2 weeks ago . No food poisoning , so far . I can eat only so much crackers with this sauce and making these cheesecakes is one surefire way to consume it once and for all . I used the recipe that I've seen at Bon Appétit , it calls for only 1 package of cream cheese ; baking it is as straightforward as you can get and no water bath ! Instead of baking it in an 8-inch square pan , I used the oddball size muffin liners that I have on hand , just perfect for these minis since you don't have to grease it . The serving size is really good if you're craving for something calorific but you don't want to make a super size version *see last photo*. Of course , you can just buy a slice to satisfy your craving ! * Preheat oven to 350°F / 180°C . Mix crushed biscuits and butter together ; press crumbs , about 2 heaping tablespoons each , evenly into 8 muffin liners . Bake for 12 minutes , place crust into freezer while preparing the filling . * With an electric mixer , beat cream cheese and sugar in a large bowl until smooth , scraping down sides of the bowl . Add in the sour cream , beat for 1 minute , add in egg , beat until just combine then the lemon juice and zest . Divide mixture into the prepared liners . Drop 3 dots of the pureéd sauce on top of the batter and lightly drag the toothpick on top of each dot . 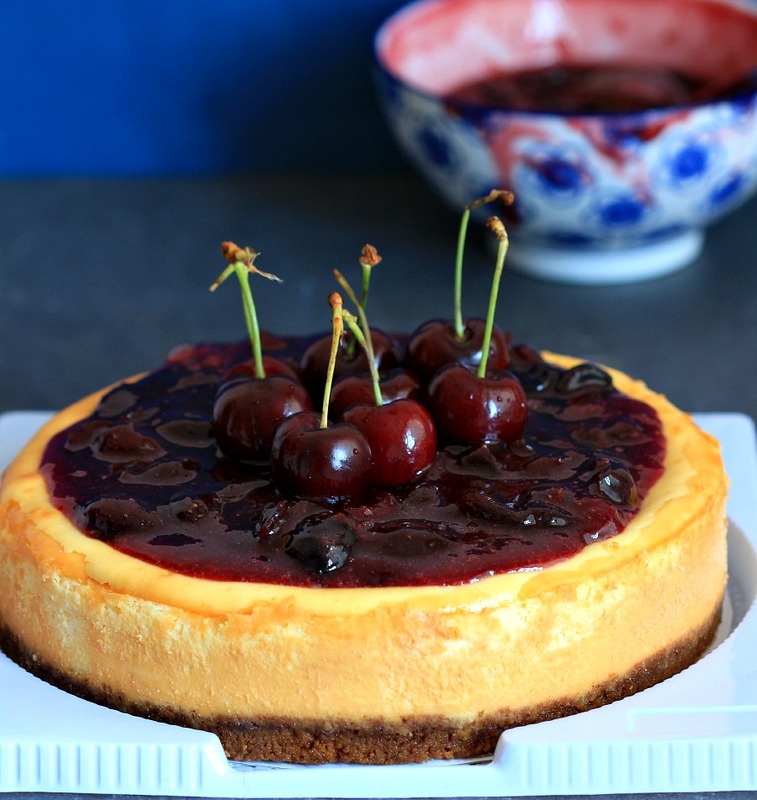 * Bake cheesecakes for 25-30 minutes or until slightly puffed and set in the center . Leave in the oven with door slightly ajar for 30 minutes . Cool completely in a wire rack and chill in the fridge for at least 4 hours before consuming . * In a small saucepan , combine cherries , strawberries , sugar , water , zest and juice of lime . Let boil and cook over medium heat for 8-10 minutes or until mixture thickens , add in the starch mixture and cook for 1 minute . Transfer sauce into a heatproof bowl and let cool completely before using . It looks very good, gosh, i almost forgot about 14 february! o fresh cherries...they must be very expensive at this time of year. 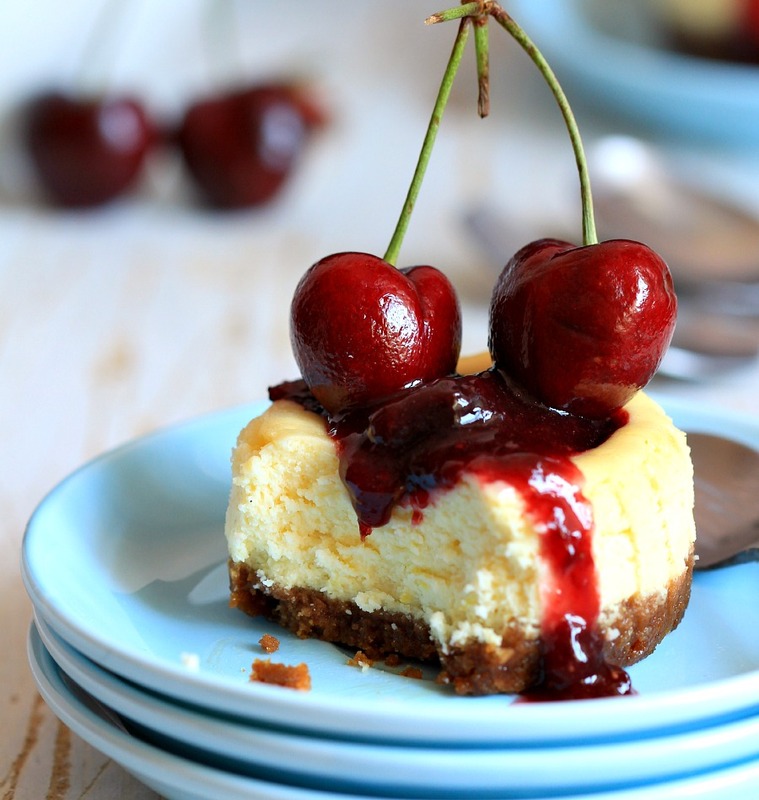 The cheesecake looks so beautiful and divine! Fiquei feliz em conhecer o seu blog, já fiquei por aqui!! !Achei maravilhoso!!! Hi Anne, your mini cheesecake looks cute and pretty. Delicious too! 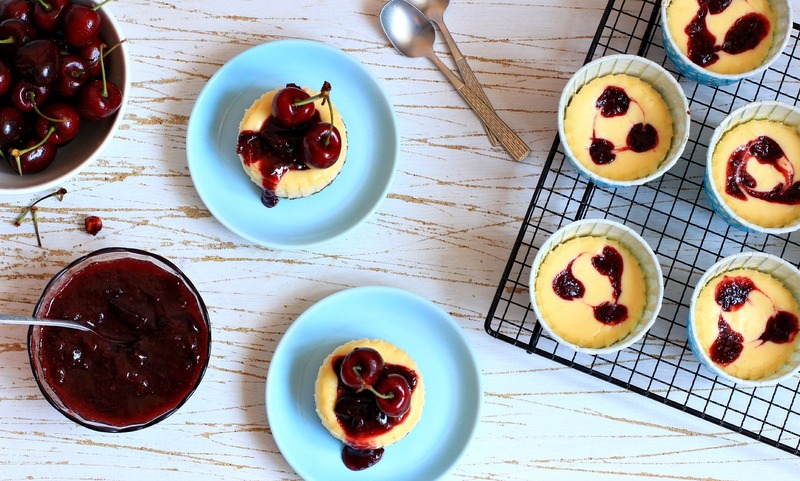 These lovely pretty Cherry-lemon mini cheesecakes looked so yummy-licious !